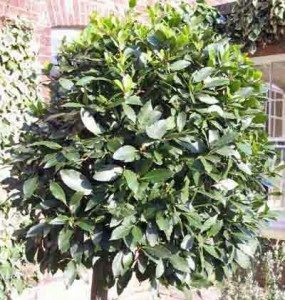 Common Bay (Latin name Laurus nobilis) has shiny, dark green, aromatic leaves & is easy to grow..
Use Bay Leaves to flavour stocks, sauces, casseroles and marinades. One or two leaves are left in a dish as it cooks then retrieved before serving. Sara from FarmingFriends had this comment on her website about black substance on bay leaves & asked if TopVeg could help. Farming Friends & TopVeg have collaborated to create a How To Grow Bay card. If you would like a pdf of the grow card for How to Grow Bay, please complete the contact form asking for the grow card for bay and we will email it to you. 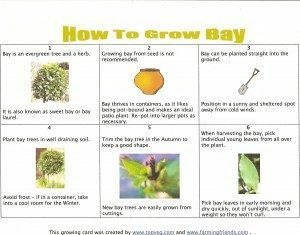 Bay is included in the How to Grow Culinary Herbs eBook written by TopVeg & Farming Friends which costs £4.